When a Dragon dies, it becomes a Dragon Tree. So holds the legend on the Canary Islands, one of the only places in the world – along with Madeira, Cape Verde, and western Morocco where the tree grows as a native. 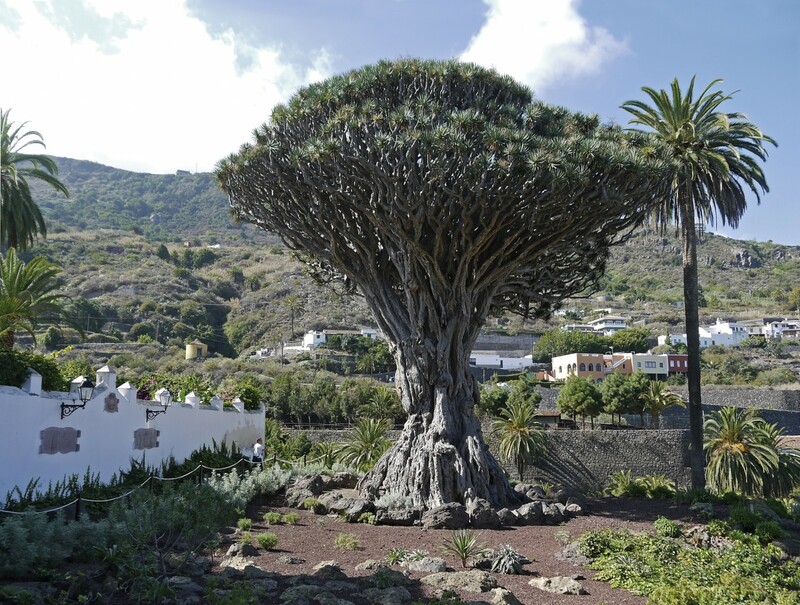 The largest and oldest Dragon Tree (Dracaena draco), on the Canary Islands stands in an enclosed garden at the Parque del Drago in the town of Icod de los Vinos, in the north-west of Tenerife. El Drago Milenario is thought not to be so old as its name suggests; 600 years would seem to be nearer the mark, but its colossal size – 10m (32.8ft) in girth and over 20m (65.6ft) tall, has led some to claim it has stood for 1-2,000 years. Sacred to the original inhabitants of the island – the Guanches – who worshipped at altars inside the hollow cavernous trunks, Dragon Trees were also used to make dug-out boats, tambourines and traditional fighting sticks, and often painted with the red sap of the tree. Known as Dragon’s blood, the sap turns red when it comes into contact with air. It was drunk mixed with milk and taken to relieve stomach complaints as well as applied to wounds to aid healing. It continues to be used as a dye, most notably for staining the wood of Stradivarius violins during the 17th and 18th centuries. The noted German botanist and explorer Alexander von Humboldt visited an even larger Dragon Tree at Franchy Gardens on Tenerife in 1799 en route to south America, and noted that its trunk measured 13.7m (45ft) in circumference. Blown down by a storm in 1867, it leaves El Drago Milenario as the undisputed King of the Dragons. In 1985 its hollow trunk was fitted with a ventilator to minimise fungal growth, and a road that passed by its south side was removed in 1993. The tree now sits in botanic gardens, fenced off from the many visitors that it lures to its den.